Football fans will soon be waking up with that familiar buzz that signals the start of a new season. Up and down the country (and further afield), pre-match rituals are set to be renewed and new shirts given their first proper outing, as football is set to take over our lives once again. Slates have been wiped clean and there’s a sense of anticipation, curiosity and hope; the hope that new signings will justify their transfer fees and become the pieces of the jigsaw that lead to it being ‘our year’. By 5 pm on Saturday, regardless of what happens at Birmingham, the familiar debates will begin again. There will be calls for patience and talk of transition and projects. There will also be those who overlook the fact that their glass is constantly half-empty because they’re too busy having a moan about the glass itself. Discussions on formations and team selection; worldies and howlers; ownership and investment; and dodgy refereeing decisions are set to continue until next May when three teams get promoted and three go down. But which teams will they be and will City be amongst them? Undeterred by a World Cup which threw up more than the occasional upset, when it comes to promotion, we’ve not looked too far beyond the teams that sit high on the bookies’ lists of favourites. And for good reason, as unlike tournament football, the 46-game slog that is the Championship, tends to sort out the wheat from the chaff. 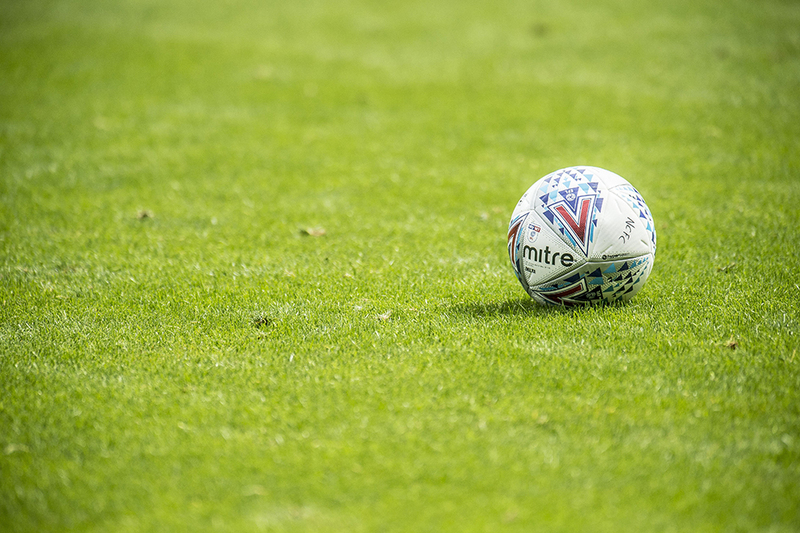 The sides who were relegated from the Premier League are strongly fancied but, as always, their fate relies on using their financial advantage to identify and retain the players who are up for a different challenge whilst avoiding a relegation hangover. In Gary Rowett, Stoke has a manager who switched from fellow promotion hopefuls, Derby, and who brings Championship pedigree and experience. They are also responsible for one of the more bizarre summer transfers with Benik Afobe switching to the potteries 10 days after finalising a permanent move to Wolves. Rowett’s replacement at Derby, Frank Lampard, will be hoping to match, or better, last season’s 6th place finish and has already used his links with Chelsea to bring in highly rated youngster, Mason Mount. Of the other teams remaining from last season’s top 6, Middlesbrough go into the season with their final parachute payment and with Premier League suitors circling for prize-asset Adama Traoré, so face the dilemma of going for broke or beginning to restructure the club’s finances. Aston Villa also have one year left on their parachute payments but had already spent it and appeared to be heading into a financial and sporting abyss, before their stricken owner, Dr Tony Xia, sold a controlling stake in the club to billionaire businessmen Nassef Sawiris and Wes Edens. Reports indicate that the pair have engaged with ‘super-agent’, Jorge Mendes, who played a significant role in Wolves’ success of last season. Whilst it was funny laughing at Villa, it’s been even funnier laughing at Leeds. However, the appointment of Argentine, Marcelo Bielsa, who has previously managed at both Marseille and Athletic Bilbao, might just bring a change of fortunes to the self-declared, ‘Champions of Europe’. Another former ‘CoE’, Nottingham Forest, who finished a lowly 17th last year, have been busy in the transfer market, with Aitor Karanka adding the familiar names of Michael Dawson, Costel Pantilimon, Jack Colback and a certain Lewis Grabban to his squad. At the other end of the table, Bolton and Rotherham are short-priced odds for relegation, meaning that Norwich loanee, Sean Raggett, is surely in for a ‘busy time’ at the New York stadium in South Yorkshire. Third favourites for the drop are none other than (….drum roll….) Ipswich Town, with the bookies seemingly less than impressed by the appointment of Paul Hurst as successor to Mick McCarthy. But what of Norwich City? 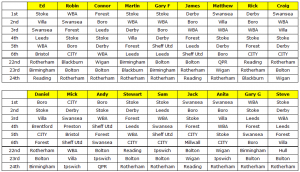 7/1 for promotion and 12/1 for relegation, suggests a finish somewhere in the top half, but shy of the top six. Unless of course, you write for My Football Writer (or at least those from the glass-half-full side of the team). Eight of us, are predicting a place in the playoffs (or better), with the award for ‘Optimist-in-chief’ going to our Mick Dennis. After Mick submitted his predictions, with City proudly claiming top spot, he was met with a reply that simply read “that’s the spirit”. It’s not clear whether that spirit was vodka or gin, but let’s hope that we find ourselves on the Castle Mound next May with something fizzy and sparkling, as we toast a bus-load of Germans waving a trophy at us. Thanks to all the regular readers and contributors to MFW, who have submitted their own predictions so far. We can’t promise any prizes (although a bacon roll was previously on offer) but it is free to join and what price could you put on the glory of being crowned MFW’s champion tipster? If you’d like to add your predictions into the mix, please do so in the comments section below. Fair comments Steve but are the one that put city like myself optimists or just short of a few marbles that is the question. At the start of every season no matter what league and what has been done in the transfer market I will always hope for a positive start and promotion at the end of the season. Just read an article on newsnow from yesterday that a Suffolk paper is promoting talks between Marcus and Delia about merging both clubs and play at some crap ground down there way also it will take the last 4 letters from Norwich and the first 3 from there name as the new clubs name. The Suffolk Gazette is one of the funniest spoof news sites out there-as long as you can laugh at yourself as most of it is based on Norfolk stereotypes. That article featured more stereotypes than usual. It did make me laugh though. NewsNow always flags it up with the word satire, as if we need to be told. Thanks for compiling this, Steve. Some of us are simply trying to improve our performance in the prediction accuracy league. In my case, from the relegation places to mid-table obscurity…. As much potential as our squad has, I just think that the league is too strong and DF would have to work minor miracles to fulfil Mick’s prediction! Even the top 10 will be competitive – I’ve just done the BBC sport Championship predictor and it’s easy to find nine other clubs who will expect to be in the playoffs at the end of the season. I don’t agree with Mick’s relegation trio, but i’d love it if he was right! Dave: are we going to get your predictions? Since I’d be randomly picking names out of a hat (I really have no idea), I have used a random number generator. This is what it said. As much as I would like to see it I can’t see the binners going down,surviving just.Bolton,Wigan and Reading for the drop.Let’s hope one of our own keeps Rotherham up with the help of Raggett.We will finish tenth.Stoke.Boro.Forest.Wba. Derby and Leeds top six. I think we have squad capable of top six with the right tactics,use of subs and style of play. Sadly the latter three are the areas of concern. The question for me is will Farke prove me wrong. I hope so!! About 8th I think but that will lead to some real problems for next year. OTBC. Prove this old fool wrong. The thing that makes it very difficult to predict this season is because Farke is on his last year of his contract. Will it get renewed? If yes, when? If not, when P45? As Daniel has failed the far to get anywhere near the best out of his squad, if that continues at the start of this season an into October, he has to go. However, this is Norwich City ‘Community Club’ and decisions regarding parting ways with managers has Delia with two fingers in her ears. Hiring and Firing is a way of life, especially with football managers. It’s cheaper than sacking the team. If Farke is fired before Xmas – approx 9th. The only thing funnier than preseason predictions is whichever chump is selected to go on Football Focus at the end of November and say that they might as well give the Championship now to Derby/Middlesborough/whichever other team is running away with the league at that point but will collapse after Christmas. If it went with the formbook then football would be boring. Hull’s collapse last season was as entertaining as Fulham’s rise. Millwall confounded the predictions as much as Reading did. There will be teams performing above expectation and below it too. I’ve got a hunch that City might be one of the former.